Situated in the heart of downtown Boston, The Langham, Boston combines its rich history with all the features of a contemporary luxury hotel. Originally the Federal Reserve Bank, this AAA four-diamond property is a national architectural landmark and one of the finest hotels in the city. 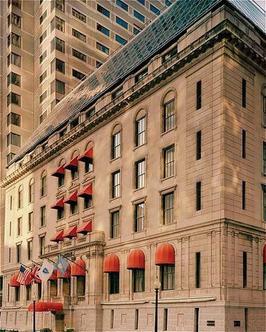 Overlooking the gardens of Post Office Square, this elegant hotel is steps from Boston's shops, restaurants and attractions, including Faneuil Hall, Newbury Street, the Freedom Trail, the Financial District, and the waterfront. Additionally, The Langham, Boston is minutes from the area's colleges and universities. Known as one of Boston's best restaurants, Caf leuri serves breakfast, lunch, and dinner, and is famous for its Saturday Chocolate Bar Buffet and award-winning Sunday Jazz Brunch. The Julien Bar & Lounge offers creative American bar fare and live piano music nightly. Other hotel features include a full-service health club and gym facility, a business center, and a number of conference rooms and banquet spaces.